Homeowners could save money on outdoor lighting by installing solar-powered fixtures. Stake lights are available with built-in solar cells that can provide enough electricity for overnight illumination. Solar-powered landscape lights are usually designed for installation along walkways and driveways. Their pointy stake supports can easily be placed several inches into the ground. The temporary installation is convenient as it does not require any electrical wiring or external hardware for support. Solar landscape lights usually have efficient LED bulbs that generate illumination of only several Lumens. However, such fixtures are usually installed in series along walkways, creating sufficient collective brightness. Plastic housings have waterproof designs to ensure that the sensitive LED light bulbs and solar cells don't get damaged during rainstorms or strong winds. Solar power for outdoor lighting is also available on much bigger scales. For example, large solar panels can be installed in a garden in order to collect electricity for use to power multiple light fixtures throughout a property. The panels should ideally be mounted on elevated structures such as fence posts, sheds or gates. 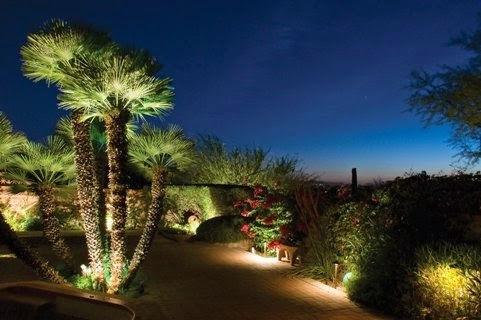 Professional lighting technicians can make the proper electrical connections between the panels and individual landscape lights. Lantern-style light posts and project lights could be powered overnight by relatively small solar panels that are exposed to sunshine for most of the day. Lighting professionals can calculate the optimum angle at which the panels should be installed in order to maximize solar absorption during daylight hours. Some gardens and backyards might even use solar panels to power other structures such as mini ponds and waterfalls that are also illuminated with special glow-in-the-dark fixtures, which utilize phosphorescence. For example, garden pond pumps could be partially powered by solar cells that are connected to multiple landscape light fixtures. When selecting landscape led lighting, homeowners should consider the color temperature that's measured in degrees Kelvin. Bright white light is a popular choice for providing natural daylight-style illumination on a property. Traditional incandescent light bulbs generate a distinct yellow or orange color that doesn't provide as many aesthetic benefits to a home or garden. Landscape lights should be optimized to produce light that can reflect off trees, bushes and grass. Yellow light tends to get absorbed by the surrounding landscape and also creates some blinding effects for the human eye.